BACKGROUND: The indications for urgent computed tomography of the brain (CTB) in the acute setting are controversial. While guidelines have been proposed for CTB in well-resourced countries, these are not always appropriate for resource-limited environments. Furthermore, no unifying guideline exists for trauma-related and non-trauma-related acute intracranial pathology. Adoption by resource-limited countries of more conservative scanning protocols, with outcomes comparable to well-resourced countries, would have significant benefit. A multidisciplinary team from Kimberley Hospital in the Northern Cape Province of South Africa adopted the principles defined in the National Institute for Health and Care Excellence (NICE) guideline for the early management of head injury and drafted the Kimberley Hospital Rule (KHR), a proposed unifying guideline for the imaging of acute intracranial pathology in a resource-limited environment. OBJECTIVE: To evaluate the sensitivity and specificity of the KHR. METHODS: A prospective cohort study was conducted in the Northern Cape Province between 1 May 2010 and 30 April 2011. All patients older than 16 years presenting to emergency departments with acute intracranial symptoms were triaged according to the KHR into three groups, as follows: group 1 - immediate scan (within 1 hour); group 2 - urgent scan (within 8 hours); and group 3 - no scan required. Patients in groups 1 and 2 were studied. The primary outcome was CTB findings of clinically significant intracranial pathology requiring acute change in management. RESULTS: Seven hundred and three patients were included. The KHR achieved 90.3% sensitivity and 45.5% specificity, while reducing the number of immediate CTBs by 36.0%. CONCLUSION: The KHR is an accurate, unifying clinical guideline that appears to optimise the utilisation of CTB in a resource-limited environment. The Northern Cape is the largest of South Africa's nine provinces, accounting for almost a third of the country's total land area, but it has the smallest population (1.45 million). Approximately 80% of the population is dependent on public sector healthcare. The 750-bed Kimberley Hospital (KH) is the Northern Cape's only tertiary-level referral centre, serving 21 peripheral healthcare facilities, and has the province's only computed tomography (CT) scanner. The province therefore has 0.86 CT scanners per million population in the public sector. In comparison, there were 29.4 CT scanners per million population in the United States (US) in 2004. [1,2] People living in the farthest corners of the province must travel 800 km to Kimberley, an approximately 8-hour journey by road. In cases of emergency, costly air transport is required. Acute intracranial symptoms are a common clinical problem, accounting for almost 6 million presentations to emergency departments (EDs) across the US every year. 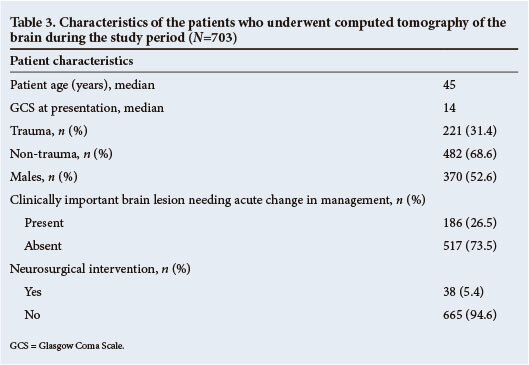 There is controversy regarding the indications for urgent computed tomography of the brain (CTB) across the spectrum of such patients, given the risks of ionising radiation, rising medical costs, and the low positive diagnostic yield if the clinical indications for scanning are too broad. In the decade before this study, there had been a steady increase in the number of requests for immediate CTB at KH, until the point was reached where the acute CTB service had to be rationalised to ensure sustainability. While much research has been done and many guidelines proposed for CTB in well-resourced countries,[5,11] to the best of our knowledge there has been no such research in resource-limited healthcare environments, where equipment and human resource constraints pose major challenges. 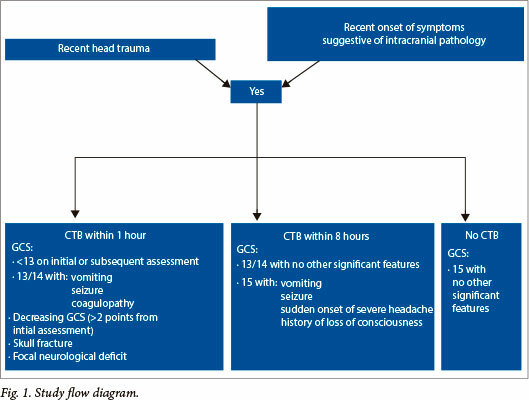 Furthermore, existing CTB guidelines have been formulated to address either trauma-related or non-trauma-related acute intracranial pathology. A multidisciplinary team at KH reviewed published CTB guidelines for adults with head trauma, as well as CTB protocols for acute medical conditions. The intention was to draft a unifying guideline that would optimise the management of patients with intracranial symptoms, regardless of their causation, within the constraints of the Northern Cape's medical resources (Table 1). We suggest that a single unifying rule is ideal in our clinical setting, firstly because transport services are limited and costly; a single rule would assist with determining which patients take priority for transport. Different rules would lead to duplication of services and potential inefficiencies. Secondly, many of our peripheral healthcare facilities are staffed by junior doctors, and a single unifying rule can aid in quick and effective decision making in the setting of a busy ED, avoiding the confusion that may arise from multiple different rules. Our team identified what we considered four key references. [5-7,13] The Kimberley Hospital Rule (KHR) incorporates the principles of the National Institute for Health and Care Excellence (NICE) guideline for the early management of head injury. The NICE guideline differentiates patients requiring an immediate scan (within 1 hour of presentation) from those requiring an urgent scan (within 8 hours of presentation). This time-dependent guideline was thought to be particularly appropriate for adaptation to prevailing realities in the Northern Cape. The need for an immediate scan on a patient at a peripheral clinic would generally involve emergency air transport, while an urgent scan (within 8 hours) would allow patients to be transported by road. 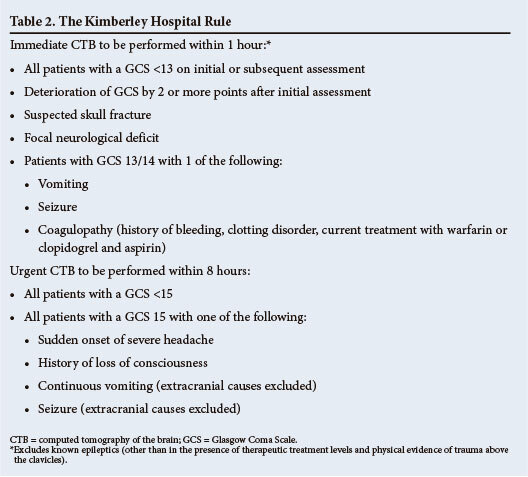 • The NICE guideline recommends a CTB if a patient's Glasgow Coma Scale (GCS) score is <15 at 2 hours after the injury, while the KHR recommends a CTB if a patient's GCS score is <15 at 8 hours. • The NICE guideline recommends a CTB within 1 hour for patients with a GCS score of 15 and vomiting, whereas the KHR recommends a CTB within 8 hours for these patients, as intoxication and substance abuse are common causes for this presentation in our setting. • The NICE guideline recommends a CTB within 1 hour for patients with a GCS score of 15 and seizures, whereas the KHR recommends a CTB within 8 hours for these patients, as poorly controlled epilepsy is a common cause for this presentation in our setting. • Although a CT scanner is available, there are staffing limitations at KH, especially with regard to radiographer, nursing and porter resources, that limit the capacity for after-hours scanning. • Radiologists and radiographers need to be called out after hours. Radiographers receive 1.5 - 2 times normal remuneration for after-hours and weekend work. Increasing the proportion of scans performed during normal working hours would therefore reduce service costs. • An immediate scan for patients from the periphery of our province necessitates costly emergency air transport, whereas an urgent scan (within 8 hours) allows patients to be transported by road. The principles underpinning the KHR may potentially be applicable to other imaging protocols in resource-limited healthcare environments (Fig. 1). We report on the first year of utilisation of the KHR. To determine the sensitivity and specificity of the KHR in identifying patients with clinically significant intracranial pathology requiring acute change in management. A prospective cohort study was conducted in the Northern Cape Province, South Africa from 1 May 2010 to 30 April 2011. All patients older than 16 years of age undergoing CTB for symptoms suggestive of acute intracranial pathology were included. The age limit was selected because it is consistent with that in cited articles on adult head trauma. The study was approved by the Research Ethics Committees of Kimberley Hospital and the Faculty of Medicine and Health Sciences, Stellenbosch University. During the period of the study, all patients older than 16 years of age presenting to EDs in the Northern Cape with symptoms suggestive of acute intracranial pathology underwent a standard clinical assessment by the duty medical officer. A customised assessment form was completed, recording patient demographics, symptoms and examination findings. Based on the clinical evaluation, the KHR determined the need for and priority of, CTB. Patients were assigned to one of three groups: group 1 - immediate scan (within 1 hour); group 2 - urgent scan (within 8 hours); and group 3 - no scan required. Patients in groups 1 and 2 form the basis of this study. • Group 1 patients underwent CTB within 1 hour. • Group 2 patients were scanned within 8 hours of presentation, as dictated by the availability of the CT scanner and auxiliary staff, and preferably during the day. • Group 1 patients were transferred to KH as soon as possible, either by air or by road if within an hour of KH by road. • Group 2 patients were transferred in groups by road (if travel duration to KH <8 hours) or by air. An uncontrasted CTB was performed on a 16-slice Siemens Somatom Sensation scanner. An additional contrasted study was performed if requested by the duty radiologist. The consultant radiologist's report was used as the reference standard. The primary outcome was clinically significant intracranial pathology requiring acute change in management. The following CT findings were deemed clinically insignificant, not requiring admission or immediate follow-up: (i) solitary haemorrhagic contusion <5 mm in diameter; (ii) localised subarachnoid blood <1 mm thick; (iii) small subdural haematoma <4 mm thick; (iv) isolated pneumocephaly; and (v) closed outer-table skull fracture. The following findings were deemed clinically important but not needing acute change in management: (i) cerebral arteriosclerotic changes; (ii) sub-acute and chronic ischaemic changes (>48 hours); (iii) asymptomatic aneurysm; and (iv) asymptomatic congenital variant or abnormality. Data were prospectively collected on patient characteristics, trauma details, symptoms, risk factors, findings on physical and neurological examination, CT reports and neurosurgical intervention. Data were statistically analysed using SAS version 9.1.3 and descriptively analysed using medians and interquartile ranges for measures of location and spread, respectively. For all nominal variables frequency distributions (with absolute and relative counts) were presented. Column charts were used to graphically represent data. The primary outcome was analysed by determining the sensitivity and specificity of the KHR as an indication of the accuracy of the clinical guideline in practice, which could then be compared with the existing international guidelines. We calculated 95% confidence intervals (CIs) for sensitivity and specificity. A significance level of 5% was applied throughout for all analyses. During the period under review, 703 patients underwent CTB. The median patient age was 45 years (interquartile range 31 - 61). GCS scores ranged from 3 to 15 on presentation with a median of 14 (interquartile range 11 -15). There were 370 males (52.6%) (Table 3). Four hundred and fifty patients (64.0%) were scanned within 1 hour (group 1) and 253 (36.0%) within 8 hours (group 2). In group 1, 168 (37.3%) had clinically significant intracranial pathology requiring acute change in management, while only 18 (7.1%) in group 2 had such pathology (Fig. 2). The KHR was 90.3% sensitive (95% CI 86 - 95) and 45.4% specific (95% CI 41 - 50). For the trauma subgroup the KHR was 100% sensitive and 33.6% specific (95% CI 25 - 42), while reducing the number of immediate CTs by 19% (Table 4). The KHR was 79.3% (95% CI 71 - 88) sensitive and 49.1% specific (95% CI 44 - 54) for the non-trauma subgroup, and reduced the number of immediate CTs by 44% (Table 4). The 18 clinically significant intracranial lesions requiring acute change in management that were missed by the KHR were as follows: hypertensive intraparenchymal haemorrhages (n=5), ruptured cerebral artery aneurysms with associated subarachnoid haemorrhages (n=4), arteriovenous malformation with an associated subarachnoid haemorrhage (n=1), and ischaemic infarcts (all presenting after 6 hours) (n=8). Overall 38 patients (5.4%) required neurosurgical intervention. We have developed a unifying guideline for the utilisation of urgent CTB. This is applicable to any patient over the age of 16 years presenting to hospital with intracranial symptoms, regardless of aetiology, making it an appropriate, easily applicable guideline in a busy ED. Our prediction rule was modified from the existing NICE guideline to differentiate between patients with acute intracranial pathology requiring costly immediate CTB (within 1 hour) from those who could safely be scanned within 8 hours. Modifying the existing NICE guideline decreased the number of immediate scans and thereby made the imaging burden more manageable by minimising the need for after-hours scanning and air transport, but not decreasing the total number of scans. We believe that we achieved acceptable sensitivity (90%) and specificity (45%) in a resource-limited environment for clinically important brain lesions needing acute change in management. The most widely applicable existing international guideline, 'Predicting intracranial traumatic findings on computed tomography in patients with minor head injury: The CHIP Prediction Rule','71 although not directly comparable, achieved a sensitivity of 96% and specificity of 25% for intracranial traumatic CT findings with its simple prediction model. The sensitivity of the CHIP is higher than that of our rule, but the true value of our rule is the increased specificity (45%) (Table 5). It is noteworthy that the lower sensitivity of the KHR applies only to the immediate CTB group. The 6% of patients with intracranial pathology who do not qualify for an immediate scan were scanned within 8 hours. In our study population the 8-hour scan delay did not lead to adverse outcomes or delay in definitive treatment. The additional requirement of our clinical decision rule was that it should be applicable to non-traumatic acute intracranial pathology. In practice this means excluding mimics of stroke to allow initiation of thrombolytics, if indicated. In the ideal setting these patients should be treated within 3 hours. In our study sample, no patient with an acute ischaemic cerebrovascular accident presented to hospital within 6 hours after the onset of symptoms, so no patients would have benefited from thrombolytics. Secondly, it was found on data analysis that haemorrhagic stroke of a magnitude requiring neurosurgical intervention would produce clinical signs or symptoms that fulfil our criteria for an emergency CTB. On subgroup data analysis, the KHR achieved 100% sensitivity and 33.6% specificity for the trauma group and 79% sensitivity and 49% specificity for the non-trauma group. This indicates that the KHR may have applicability beyond the resource-limited setting for trauma CTB. However, external validation in different populations is needed before widespread application of the rule. Currently no evidence-based guideline exists for non-trauma patients. Although our non-trauma guideline is not as accurate as we would have liked, it lays the foundation for future formulations of nontrauma guidelines. A limitation is our relatively small study sample in this review of the first year of clinical utilisation of the KHR. This contributed to the wide CI for sensitivity. 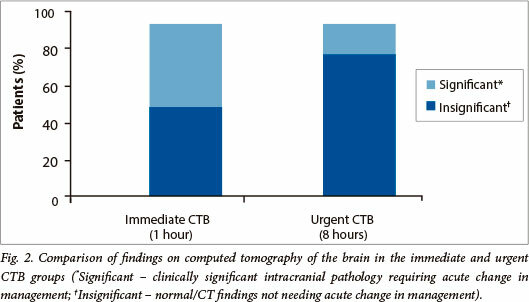 Of the 18 patients with clinically important brain lesions needing an acute change in management that were missed by the KHR, only 5 subsequently underwent neurosurgical intervention and all 5 neurosurgical procedures were performed on a non-emergency basis, indicating that the 8-hour delay in performing CTB did not lead to adverse clinical outcomes. 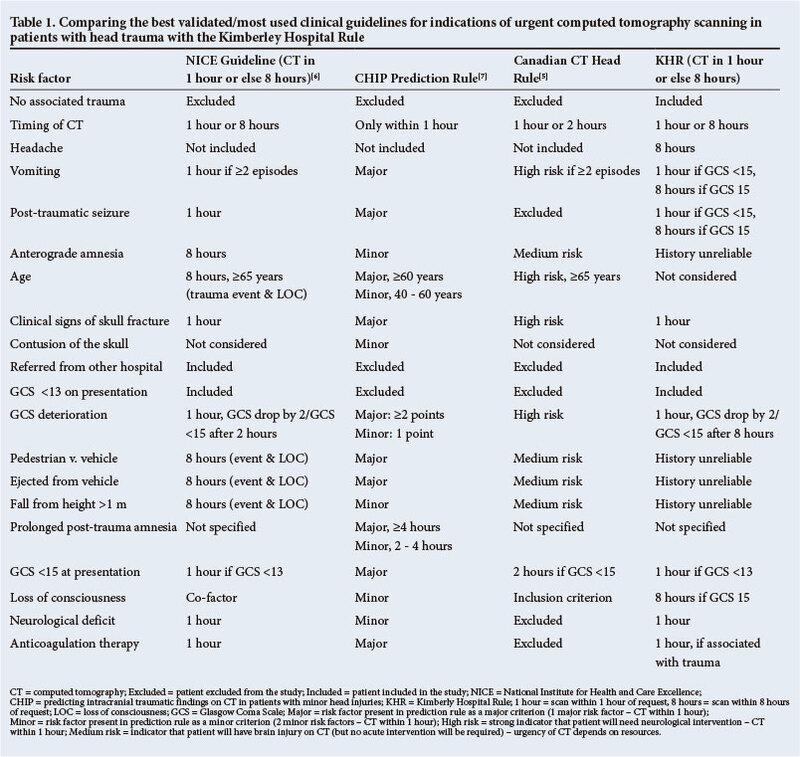 Because not all patients with suspected intracranial pathology routinely undergo CTB, we could not ethically mandate CTB in patients without symptoms or signs suggestive of intracranial pathology (group 3). Furthermore, the socioeconomic circumstances of many of our patients and the vast geographical area of the Northern Cape were practical barriers to follow-up, by telephone call or home visit, of most patients who did not undergo CTB, so this group of patients was excluded from the study. We therefore do not know the incidence of pathology in patients presenting to emergency units who did not qualify for CTB. However, as KH is the only tertiary hospital in the Northern Cape and has the only state-owned CT scanner, we postulate that if a patient subsequently experienced symptoms, they would have been referred back to KH and we would be aware of them. Many clinicians may be surprised that the mechanism of injury and post-traumatic amnesia are not features of the KHR. We found those two issues difficult to address in our clinical setting owing to our multi-cultural society and 11 official languages, which often makes accurate history taking difficult. We believe that the KHR is a safe alternative to existing international guidelines with acceptable sensitivity and specificity, and that it will assist in providing more consistent imaging of acute intracranial pathology and reduce time-consuming transfers and costly after-hours CTB. We propose the KHR as a unifying guideline for the utilisation of urgent CTB. The KHR is applicable to any patient over the age of 16 years presenting to hospital with intracranial symptoms, regardless of their cause, making it an appropriate and easily applicable guideline in a busy ED. This evidence-based rule will assist in providing more consistent imaging of acute intracranial pathology and reduce CTB costs while not leading to adverse patient outcome. Application of the KHR to the trauma population was shown to be 100% sensitive, making it potentially universally applicable in both well-resourced and resource-limited settings. It should be noted that the KHR has poor sensitivity for detecting acute ischaemic strokes and would therefore not be applicable in institutions offering an acute stroke thrombolytic service. External validation in different populations is needed before widespread application of the rule. The KHR may be used to aid in decision making, but should not replace sound clinical judgement.